Punxsutawney Phil wasn’t joking when he predicted six more weeks of winter in 2015. Late-season snow, dangerous ice storms and record-breaking low temperatures have chilled the country from coast to coast. The Northeastern United States has been hit hardest, especially in areas like Boston, where nearly 9 feet of snow has fallen this winter alone. The Washington, D.C. metro area has had its share of heavy snowfall as well, with the latest snowstorm on March 5 bringing in more than 4.5 inches to break a 127-year-old record. The impact of the weather was seen across the metro area as county school systems closed, nearly 800 flights were canceled between Reagan National Airport and Dulles International Airport, and federal offices shut down. 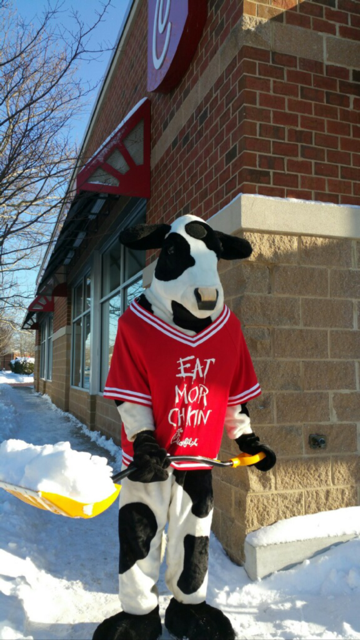 Chick-fil-A Kentlands Square received 8-10 inches of snow. Just outside of D.C. in Gaithersburg, Md., the Chick-fil-A at Kentlands Square was hit even harder, receiving about 8 to 10 inches. The snow on March 5 didn’t begin to fall until around 8 a.m., so restaurant franchise Operator Brian Summers and his morning shift team of six team members arrived at 6 a.m. just like any ordinary day. When the snow started to pile up, they knew they had a serious winter weather situation on their hands. But regardless of the weather, Brian and his restaurant team stayed open. The snowplow crews weren’t the only ones searching for an open restaurant. Washington, D.C.’s FOX 5 Reporter Tom Fitzgerald and his photographer Joe were in search of coffee, so when they found out the restaurant was open, they stopped in right away.